Sunday marked the end of New York Comic Con and the start of a new era in Doctor Who history. A new crew, a new showrunner, a new cast, and the first female Doctor took over as the Thirteenth Doctor started her adventure on the BBC show Doctor Who. 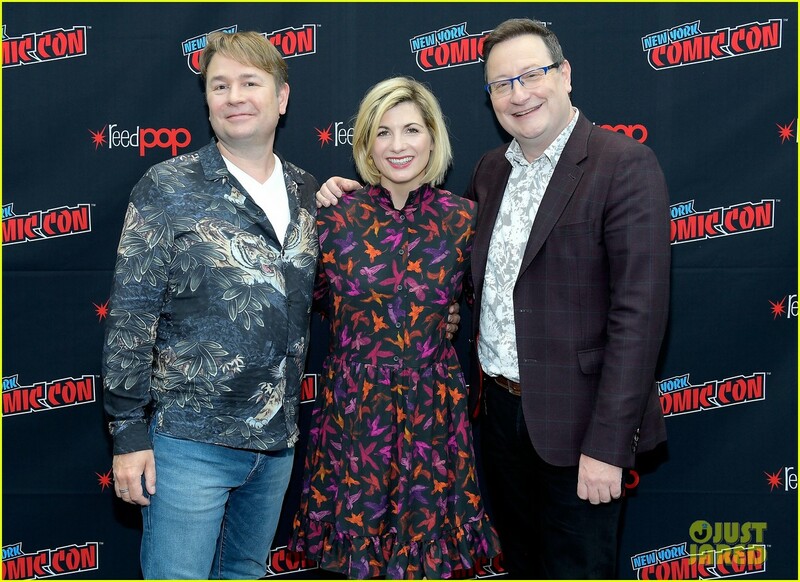 MuggleNet got to chat with executive producer Matt Strevens, showrunner Chris Chibnall, and actress and Thirteenth Doctor herself, Jodie Whittaker. They shared their thoughts about the new season, the importance of having a female Doctor, and representation in general, as well as their love for Harry Potter. While Jodie Whittaker admitted to not knowing much about Harry Potter, she was able to share her insights about working on the new season and being a role model to girls all around the world. You can look up to people whether they look similar to you or not because it’s been kind of expected of us our entire lives. But I think the wonderful thing is, the Whovian fans in the Whovian world are so inclusive there. As a new Doctor without any screen time yet that they’ve seen, to be that welcomed and embraced is really emotional in particular because anyone can wear the costume as they’re dressing as the Doctor, but now young girls can dress as the Doctor and it fit. Talking about her fellow cast, Jodie also expressed her wish of having them with her at the event since it is a shared effort. She also pointed out that it was very helpful to have such a good chemistry on set since shooting a season of Doctor Who usually takes about eight months. And it becomes clear from the first episode that while Jodie plays the lead character, the TARDIS team is as much in the center of attention, which makes it easier for audiences to identify with the show. Additionally, having such a diverse cast helps people see themselves in the show and connects Doctor Who with our modern-day world. The cast represents not only multiple ethnicities and a female lead but also people with disabilities. Talking with showrunner Chris Chibnall, on the other hand, it became very clear that he is a big fan of Harry Potter and that he would love to work with J.K. Rowling or even just have her come to visit the set. If J.K. Rowling wants to have anything to do with Doctor Who, please give her my phone number straight away. I think she is one of our greatest living writers. I think Harry Potter is an absolute transcendent piece of work, and continues to be with the theater play and with Fantastic Beasts. J.K. Rowling is a genius. If she ever even just wants to come and see what we do on Doctor Who, you tell her from me, the doors are open. Chris also made it quite clear that while this was a new era of Doctor Who, he really wanted to go back to the basics and create relatable characters, such as the ones we know from the Harry Potter series. And while this recipe of a magical world with relatable characters and problems has worked very well for J.K. Rowling, it seems that the new season of Doctor Who has taken that to heart and will even go further with characters from all backgrounds, ethnicities, and genders. It sort of goes right back to the original series in 1963. There were three companions – two teachers and a school girl. And so there were very real and relatable characters. And so what we’ve done is, our characters are very real-world characters. It was really important to us that they felt like the audience watching [and] that you could relate to them and that they’re the reality, and the magical element is the Doctor. Later on, during the Q&A panel, he went further and apologized for the two white guys talking about diversity but said that it has definitely been part of the creation of the new series. He also explained that the character Ryan Sinclair, who has dyspraxia and was shown to battle with it in the first episode, was going to continue struggling with it but that it is just one of many character traits that will define Ryan. As Potter fans, we are used to seeing well-rounded characters with flaws that allow us to identify with them and see ourselves in them. The fact that Doctor Who has gone even further with a female lead and more diverse characters at the center of a show that has always been about friendship, adventure, and drama makes me hopeful for the upcoming season but also the future of TV in general. Aurelia Lieb: Hi, I’m from MuggleNet, [a] Harry Potter fansite. Jodie Whittaker: Okay. Brilliant, okay. Don’t quiz me. Aurelia: So I was just wondering, are you allowed to do your local accent? And I’m from Germany so I’m really curious about that. Do you think that’s going to change the show a lot? Press: Hi, I’m Sharareh Drury. I’m from Culturess. So my question for you is how do you feel about being this incredible role model for little girls and women? Without even an episode airing yet, there [are] already people cosplaying as you and sharing on social media how they’re excited about that. How do you feel about that? Jodie: I think it’s wonderful just because of when I was younger, the characters and the people that I looked up to in the roles within films and television were most of the time played by men, and I didn’t question it. I was absolutely happy to look up to those and I think the suggestion that a girl is a hero for a girl and a man is a hero for all is… Hopefully, we’re now realizing that’s not the case. You can look up to people whether they look similar to you or not because it’s been kind of expected of us our entire lives. But I think the wonderful thing is, the Whovian fans in the Whovian world are so inclusive there. As a new Doctor without any screen time yet that they’ve seen, to be that welcomed and embraced is really emotional in particular because anyone can wear the costume as they’re dressing as the Doctor, but now young girls can dress as the Doctor and it fit. We’re going in order. We’re very, very industrial about this. Press: Hi, Marie from PRWeb. I want to know how important is this role for you in the era of the #MeToo movement. Jodie: Well, I was cast before, and so I think… For me, the importance is the united voice of women being heard [and] being listened to now in every capacity, and the #MeToo movement has opened the representation on screen in the… I’m not sure about here, but in the UK about gender pay and the pay differences and things and I just think it wasn’t an intentional move because it wasn’t jumping onto something, being cast in this role because I was cast beforehand. But the fact that this year and the past year and hopefully the future is about a more inclusive and safe and open to conversation environment for us. It’s timely without it being linked. That’s my best way of answering. Press: I’m Lunabelle from Bleeding Cool. What’s the best piece of advice you’ve received from previous Doctors? Jodie: There’s quite a lot, but one of the main ones was this is like no journey that can be explained to you. There [are] many acting roles in life that you are lucky enough to do, but this is one of those extraordinary ones – not completely unique – but extraordinary that you share that journey with people that you don’t share screen time with. So I have these people that I can refer back to, but the wonderful thing that they’ve said is it’s just the most extraordinary journey for life, and it’s to be enjoyed and it will go like that. Press: Hey, I’m Justin Cook from Flickering Myth. So this is like a new era for the show because new showrunner and new cast. So what [has] it been like finding your footing with Brad [Walsh] and Tosin [Cole] and the rest of the cast? As you’ve been working together, has it been more comfortable? Jodie: I mean, it was immediate. I mean, Tosin in the audition was hilarious because he is… So I’d been cast. Brad was cast because Chris had a relationship with Brad previously say to this season. Mandip [Gill] and Tosin, there was an audition process for them. I was brought in to their audition. Tosin had been away and had completely missed the whole reveal of the Doctor and was like, “Who’s this in my audition? Who was that? Ahh, they brought someone in to read with me,” and his agent was like, “That was the Doctor.” And he was hilarious. Mandip, from the second she walked in the room, she had me in stitches over some anecdote that she told and I was just sat there going, “Oh, please be my best friend. Please be my best friend.” And Brad, who I didn’t have any previous relationship with – but I’ve got a lot of friends who know and love him – I knew he was going to be an absolute riot. It was instantaneous, the chemistry and the love. And I’m not a method actor, but as far as being in love with those people on and off screen, there is no effort required for chemistry. And their performances as well as being good people as phenomenal actors in this journey and on and off screen as a support network and team players. We are an ensemble. And it feels strange to be here without them because it is an ensemble piece. But it’s wonderful knowing they’re there. Press: Karen Butler from UPI. And I remember interviewing you for Venus many years ago, so I just know that you’ve been doing great work for many years. But the notoriety for this is unparalleled. So how are you adjusting just as a human being in this world? Jodie: Yeah, it’s an unusual journey and there [are] very few roles, which I’m sure a lot of the actors cast in Marvel and obviously Bond and all those things you are famous before you’ve stepped on set, so you’ve made this huge life choice for your family forever and yourself and your career. You are a familiar face before you’ve accepted [to] yourself what that will mean. And also with the acting requirement. At that point, I was like, “I’m a pretty confident person and I know I can do it,” but even when my hood went back and I was revealed, I hadn’t shot any of it yet. I was still like, “Please be good. Please be good. Please don’t mess this up.” So it’s an adjustment and I suppose what I’ve had previously because of not just in the industry is “Oh, I recognize you maybe from that, maybe from that.” This is “I know who you are.” And that’s an adjustment but it’s been a very warmly received moment. So no no horror stories yet. Right. Where are you from? Press: Blackbird Problems. So in terms of just your familiarity with the other Doctors, was there anything you saw from the other incarnations of the Doctor that you wanted to take from, like a strength or something that you really wanted to draw from? Jodie: So because the Doctor obviously… And as you know, Whovians know the character traits in there. Whether someone’s incarnation brings new things, you never lose who the Doctor is throughout. For me, I came at this as a new Whovian and I wasn’t brought up in a Who house, but having lots of friends in the industry and a few of them being previous Doctors, I’d seen it, but I wasn’t someone who’d seen entire seasons or entire character arcs or story arcs. For me, if I [were] about to play Lady Macbeth, I would not go watch Macbeth on stage, the current production. I want to enjoy this at the end when I hand over these shoes and watch for… So the majority of my research was reading and taking it from that, purely because I wanted. You can never be wholly unique and you can never be wholly inventive. But I wanted to feel that I was open and responding and using my instinct and not thinking, “Have I just nicked that from somebody else?” I mean, I probably have and there are happy accidents within the comparisons, but none of it was intentional. Press: One quick question. Sharareh again from Culturess, just so it’s there. What of the episodes that you’ve filmed for this series would you find your favorite? If there'[re] even tiny details, or if it was something that you got to do or a scene that you got to do. Jodie: There’s a moment in every episode, really. Chris said this earlier so now I can say it: There’s a really wonderful action sequence in Episode 1 that you’re about to see that is wonderful and epic. Not a spoiler. And that was incredible. I think we shot in South Africa and that was relevant to a couple of episodes and that was extraordinary, the crew, the local people, the place… I mean, as a tourist you would never be dropped in these extraordinary landscapes, so that was wonderful. But I think the fact that all of this is new worlds and new monsters feels amazing because for us, we’re not wiping a slate clean, but we are giving people the opportunity to take ownership to this season and I’m so excited for everyone to meet those, as fans and as potentially new fans to the series. It’s a free-for-all now, guys. Just chuck in. Press: Do you or you as the Doctor have a special message for young girls watching today? I have an 11-year-old daughter. Jodie: Well, I think if you’ve never seen the show, this show is for you and this show in 2018 represents you, your social circle, your ability, your chance to not clap from the sideline. And for young boys, this is your opportunity to see your hero and not have anything removed from the things you loved, but just look a different way. But that’s not a disconnect. That’s more of an inclusion than an exclusion. Chris Chibnall: Okay. Tell us who you are and where you’re from when you ask and then we’ll answer anything. We’ll tell you the whole story of the whole series. Yeah, no. But go. Fire away. Do you want to go around? Is that the best thing? Okay, cool. Nice T-shirt. How are you? Aurelia Lieb: I’m Aurelia. I’m from MuggleNet, a Harry Potter fansite. Chris: Oh, amazing! I’m a massive Harry Potter fan. And my kids. Oh my God. Can’t begin to tell you. Aurelia: So my question is actually… J.K. Rowling was supposed to do work with Russell T. Davies and David Tennant. Would you like to do something with her? Chris: If J.K. Rowling wants to have anything to do with Doctor Who, please give her my phone number straight away. I think she is one of our greatest living writers. I think Harry Potter is an absolute transcendent piece of work, and continues to be with the theater play and with Fantastic Beasts. J.K. Rowling is a genius. If she ever even just wants to come and see what we do on Doctor Who, you tell her from me, the doors are open. Did you expect that answer? Yeah, there you go. Press: I’m Sharareh Drury. I’m from Culturess. I’m based in Chicago. So my question for you is, the Doctor has had a habit of swinging between cycles of pacifism, I guess, and epic violence in the shows. Where do you feel that this Doctor’s philosophy falls on that spectrum? Chris: Pacifism. Very, very important to us, I think, and for the Thirteenth Doctor. Pacifism is a really important part of Doctor Who. The stories are solved not through throwing punches, not through fights. They’re solved through thought and wit and intelligence and teamwork, and those values are really, really important to us in this version of the show. So Jodie’s Doctor is an absolute resolute no guns pacifist, yeah. Press: I’m Maya. I’m from Black Nerd Problems and Vulture. So it seems like there are a lot of companions this season, and typically there’s only one, maybe two companions. How does that change the dynamic? Matt Strevens: Well, funnily enough, it sort of goes right back to the original series in 1963. There were three companions – two teachers and a school girl. And so they were very real and relatable characters. And so what we’ve done is, our characters are very real-world characters. It was really important to us that they felt like the audience watching [and] that you could relate to them and that they’re the reality, and the magical element is the Doctor. This magical alien comes in and teaches them and shows them that they have wonderful gifts and wonderful innate… They can make a difference and the Doctor relies on them. She doesn’t just play them lip service and get them to validate her view. She often uses them in our version of the show to help her out with problems. And I think that is what’s great about it. It’s Doctor Who, actually, [and] although the Doctor is the eponymous character, it’s actually about the companions and it’s about them viewing… We are the companions; we watch through them looking at this magical character of the Doctor. So with Chris’s brilliant creation of Yas, Ryan and Graham, we get three wonderful very different perspectives and very different people going on a different journey and needing different things from their journey with the Doctor. So I think it’s allowed a lot of emotional exploration going to show. Don’t you think, Chris? Chris: I think so, yeah, because it’s funny. It’s like sometimes when you get asked these questions… First and foremost Doctor Who is a drama, and a drama about people. And what it gives you is hopefully everybody… What we want to do is be making a version of Doctor Who that is accessible to everyone, is inclusive, that everybody feels like they’ve got a character that feels like them that they can relate to or that they can connect with. And then the relationships that grow between those people who don’t necessarily all know each other at the start – you’ll see later today – that those relationships grow and change and shift, and the relationships with the Doctor change and then you’ve got different iterations of who’s going off there, and who’s going off there, and how are they pairing up, or individuals? So it gives you more choices and more surprises and more fun over those ten episodes. So it’s really just going, “Well, what would you do in any drama nowadays?” I think it’s always much less “What has Doctor Who done before?” because anybody who has made it before us is making the show for the time they were in. We’re making it for the time we’re in That’s why pacifist Doctors are important and that’s why I think of teamwork and a gang and this Doctor leading from the front a group of people. That feels really important and central to our version of the show, if that makes sense. Good. Phew! Press: How exciting is this for you, making the first female Doctor? Chris: You know, it’s really, really exciting and it’s a very emotional day. It’s a very moving day for all of us. I’ve been watching Doctor Who since I was three and to be here in New York and to be showing it in front of 5,000 close friends later on… I didn’t expect to be doing this. But Jodie talks about this really well when she says it’s great that it’s a moment, it’ll be great when it’s not a moment, and [it] will be great when it’s just ordinary. So it feels a privilege. It feels very humbling. And I hope you’ll see it when you when you see the episode: She’s just the Doctor. And that’s the most exciting thing for us, in that we’ve known for a year. Then we saw her do it. And that’s really the most exciting part of today is, I hope, all the audiences will feel what we feel, which is that. Even that discussion or that debate becomes just irrelevant. It’s just a brilliant performer playing the Doctor. You feel safe the minute she appears. She’s the Doctor. There’s no adjustment needed. And often when an iconic character changes, whether it’s a new James Bond or another new Doctor or a new person playing Spider-Man or Wonder Woman, you always have to go, “Oh, okay. All right. Oh, gosh.” With Jodie, it’s… And we knew how brilliant she was. But even for us, you never know until you see her on camera on the set doing it, and there was this sort of this… It was it was almost a religious experience. “Oh my God. She’s the Doctor.” And that’s it. Bang. And then it happened with the crew. Press: Hi, I’m Amanda from Bleeding Cool. Why did you choose to do all stand-alone episodes for the first? Chris: It felt very important to me that… Like always, with a new Doctor, you’ve got that opportunity for people to come on board. So what we wanted to do was a series of stand-alone episodes that if you come in at Episode 1, you don’t need any prior knowledge. If you come in at Episode 9, you don’t need any prior knowledge. If you’ve got prior knowledge, it’s going to be more rewarding. But what I think is exciting is any new Doctor’s first series [is] hopefully one long recruiting video for the series. We think it’s the best idea television ever had, and so what you want to do is express that. You want to communicate that passion and love to new viewers and go, “Come in this year, and guess what? There [are] 55 years of back catalog that you can then… Which is totally awesome [and] totally varied that you can you can then investigate. And also, because there [are] kids who will have been four or five when Peter came in, who are now just hitting the age of maybe eight or nine when it’s probably about the right age to join the show [and] have your Doctor. The thought for us… One of the big moving things, I think, is the thought today of all the kids across the world who are going to have Jodie as their first Doctor. That gets us all quite emotional. So really just to make sure that everybody could access it because we love it so much. Press: Justin from Flickering Myth. I was wondering what was some of the advice you got from previous Doctors and showrunners about tackling the show? And then also, stepping in to do the first lines of dialogue with Jodie. What was that like as well? Chris: So the advice from… I didn’t get much. The stuff they told me was quite logistical, like be careful where you live. So there’s a lot of that. But one of the notes was from Steven [Moffat]: “Make sure they keep feeding you during a long day of meetings.” It was stuff like that. Stephen, also, I think had a great phrase when you’re when you’re writing on the show. He said, “It’s not a piece of fragile china. You’re not carrying a piece of fragile china across a room. Everybody will tell you that you are, but you’re not. You’ve got to make it your own.” And he said that to all the writers. And obviously, I wrote it all down. And that’s what we’ve kept saying, is that the show demands that you make it your own. And for some people, that’s scary. And as the Doctor says later on today, “You can be scared. But that’s okay.” And then the first day on the regeneration… Well, you can’t really believe it, to be honest. It’s just sitting there going, “Jodie is there in Peter’s costume. We’re at the monitors. We haven’t made the rest of the episode. You come in for like 90 seconds. And by the way, then you blow the TARDIS up.” So you’re like, “Okay, it looks like we’re in charge now. I guess we just do this.” It was amazing. Press: I’m Karen Butler with United Press. Was the reaction to Jodie’s casting what you expected, and how do you deal with all that expectation from fans? Chris: You know what, you just have to make the show so you block that out. The reaction to Jodie’s casting was way better than we expected. We thought it would be a massive 80/20 against, and it was 80/20 in favor, I think, really. Press: Why did you think that? Just because it broke tradition? Chris: Yeah, because people don’t like change. And actually, it turns out people actually do like change, which is interesting. I think expectation is a different thing because you really just are making a television program, and that you’ve just got to focus on making a television show. We got to make a really good television show, and what we benefit from, and I feel very privileged about, is we are standing on the shoulders of all the people who’ve made Doctor Who before. We’re standing on the shoulders of Verity Lambert and Waris Hussein and Robert Holmes and Russell and Steven and Andrew Cartmel and Ben Aaronovitch… All those amazing people. They’ve done the work that allows us to come in and take this, and so the expectation is more personal. You go, “I want people to feel about Doctor Who how I always felt about it when a new series started.” That’s what’s driven us and everybody on the show. And actually, the expectation as well is from the production team. They’re the best production team in the world. They’re amazing. They achieve miracles on lower budgets than other shows have, and we never want to let them down so we. So we don’t want to et them down, we don’t want to let ourselves down, and we don’t want to let the audience down. Matt: Yeah, they’re our first audience and if they’re loving it, then we think, “Oh, we might be doing something right.” Definitely. Thank you! Chris: Thanks, guys. Thank you so much. Lovely questions.